Just blocks from novelty shops that sell sequined tube tops and Elvis key chains, up from the corner where wishful thinkers strum cheap guitars, past the bedazzled, fringed, and spurred crowds, stands the mother church of country music. 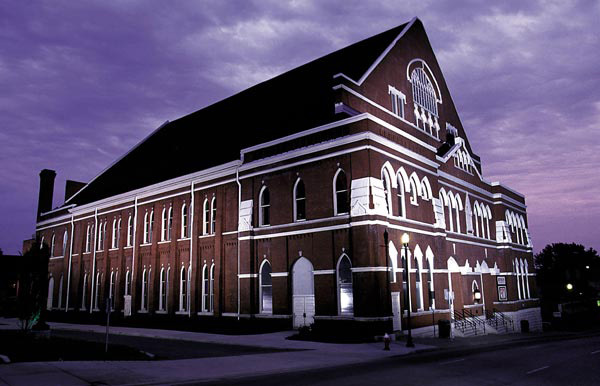 The neo-gothic, red brick Ryman Auditorium, with its rows of windows and slanted roof, is nestled between Nashville’s skyscrapers and honky-tonks. Inside, the auditorium, with its high ceilings and original pews, is haunted by ghosts, both holy and not. John Dowell, museum supervisor at the Ryman, visited the famous auditorium when he lived in Nashville as a young child, and though he had moved from the city by the age of 7, the legendary place stayed with him and he eventually began working there. Now, as he oversees tours, he gets to explain its history, and one gets the feeling his long standing relationship with the place he calls “magical” is never far from his mind. Though most might think of Hank Williams performance and the early days of country music as the beginning of the Ryman, it was actually half-a-century before when the building got its start as the Union Gospel Tabernacle, a vision of Capt. Thomas G. Ryman, who wanted to construct a place to host Nashville revivals. “Anything that could be seen as a moral or educational type of program was OK from day one,” says Brenda Colladay, museum and photograph curator for the Grand Ole Opry. The auditorium, which today hosts acts like the Raconteurs, Ray LaMontagne, and k.d. lang, was, for years, the home of the Grand Ole Opry, the longest running radio show in the country. Though the Opry moved to its current location in 1974, the members understood the importance of the Ryman to their history. When the Opry moved, a round piece of the Ryman’s stage was inlaid on the Opry’s new stage. Today, the Opry’s featured act will stand on this circle during their performance. More than thirty years since the Opry relocated, and over a decade since its renovation, the Ryman is still a Mecca for Opry fans. Dowell remembers when in 2002 a woman arranged for her 68-year-old husband, who lived outside London, to tour the Ryman and see the Grand Ole Opry for his birthday. During the tour, the man remarked what a shame it was that when he went to see the Opry that night it would be at the Opry House, not the Ryman. Dowell knew the Opry had returned to the Ryman for several months and when he told the man, the visitor began to cry. According to Dowell the acoustics at the Ryman are second only to the Mormon Tabernacle. “You can hear yourself on stage like an audience member would hear it,” explains Dowell, who has played on the famous stage as part of “Ryman Stars on Stage,” an event where Ryman employees are invited to perform. Though the Ryman is known for its acoustics, the legendary names that seem to hang in the air in the auditorium give the place its real mystique. Ryman Auditorium "Mother Church of Country Music"